Wherein Dr. Leidy shows some pictures of mosasaur bones from Kansas, provided to him by Mr. W. E. Webb of Topeka, Kansas. These were possibly the first pictures ever taken of mosasaur bones and certainly the first ever taken of a Kansas mosasaur specimen. A recent check with the Philadelphia Academy of Natural Sciences indicated that the photographs are not in their files. Dr. Leidy exhibited some photographs of fossil bones, received from Mr. W. E. Webb, Sec. 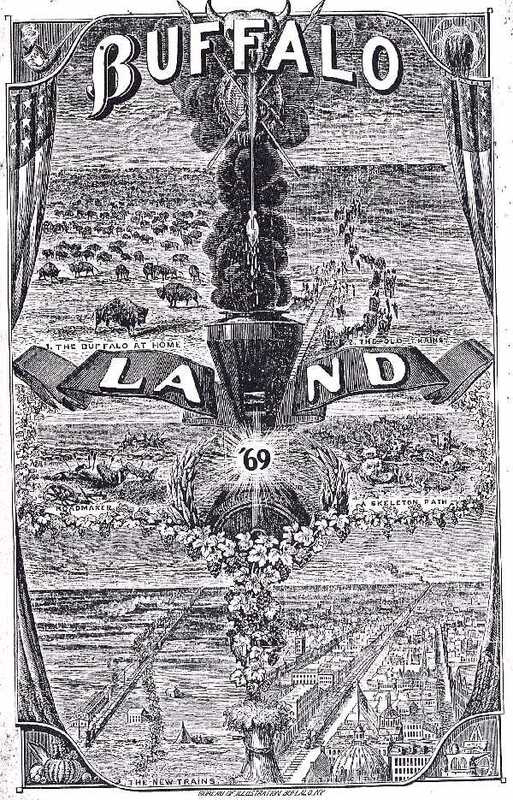 of the National Land Co., at Topeka, Kansas. They represent vertebrae, and fragments of the jaws with teeth of a skeleton of Mosasaurus, reported by Mr. Webb to be about 70 feet in length, recently discovered on the great plains of Kansas, near Fort Wallace. Louis was a wiry little Gaul, very positive in his ideas about everything. An animated conversation sprang up at once between him and the Professor, and it soon became amusingly evident that his geological ideas did not entirely accord with those of the Philosopher. A sudden turn in the colloquy developed a fact of keen interest to even the most unscientific member of our party. Pointing to the other side of the valley, Louis told us that there lay the bones on an immense snake, all turned to stone. This sudden voice from the past ages sounded in the Professor's ears like the blare of the trumpet to a warrior. He hurried us forward in the direction indicated, and, locking arms with the bloody-shirted little Frenchman, strode on in advance. I wish his class could have seen him thus traversing the desolate bed where that old sunken volcano went to sleep. We were glad that the latter was still asleep, and and never acquired the habit of snorting into wakefulness, and pelting explorers with hot rocks. What mysteries, I have often thought, might we not discover, on looking down the throat of a healthy volcano, if some wise alchemist could only brew a dose sufficiently powerful to stop the fiery fellow's foaming at the mouth! Or, better still, if it could, reach the bowels of the earth, and keep the whole system quiet, while we, puny mortals, like trichina mites, swarmed down the interior, and bored scientifically back to the crust again. Earth's veins run golden blood, and we might be gorged with that, perhaps, ere making the exit into the sunshine again. speculations, and called our attention to the Professor. He stood waving his slouched hat for an instant, then bent close over the ground, in earnest scrutiny. A few moments later, and we all stood beside the huge fossil. It lay exposed, upon a bed of slate, looking very much like a seventy-foot serpent, carved in stone. Part of the remains had been taken up to the town, and spread over the bench, in the shop of Louis. From what was left, the jaws appeared to be over six feet long, the sharp hooked and cone-shaped teeth being still very perfect. A few broad fragments of ribs showed that, in circumference, the animal's body had been about the size of a puncheon. We felt confident that the specimen was a very rare one, as Muggs had never seen anything like it, even in England. It now rests in the museum at Cambridge, Massachusetts. "This fossil, gentleman," said the Professor, is that of a Mosasaurus, a huge reptile which existed in the cretaceous sea. This appears to be one of the largest members of the family yet discovered, its length, as you will perceive, being over fifty feet. The species to which it belonged swarmed in immense numbers, but were surrounded by monsters even more remarkable than they. The deep which they inhabited must have been constantly lashed and torn with their fierce conflicts; for it was an age of war, and the powers of offense and defense, which the monsters of the period possessed, were terrible. Winged reptiles filled the air, in appearance more hideous than any creation of the imagination. Cope, E. D., 1872. 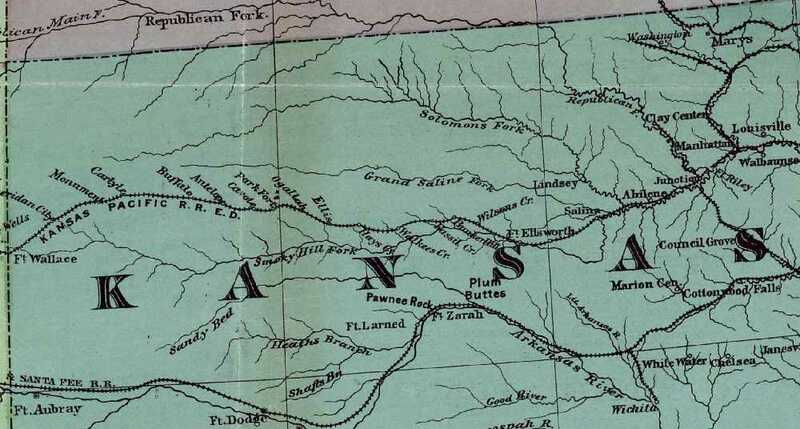 On the geology and paleontology of the Cretaceous strata of Kansas. Annual Report of the U. S. Geol. Surv. Terr. (Hayden), 5:318-349, Report for 1871. Davidson, J. P. 2003. 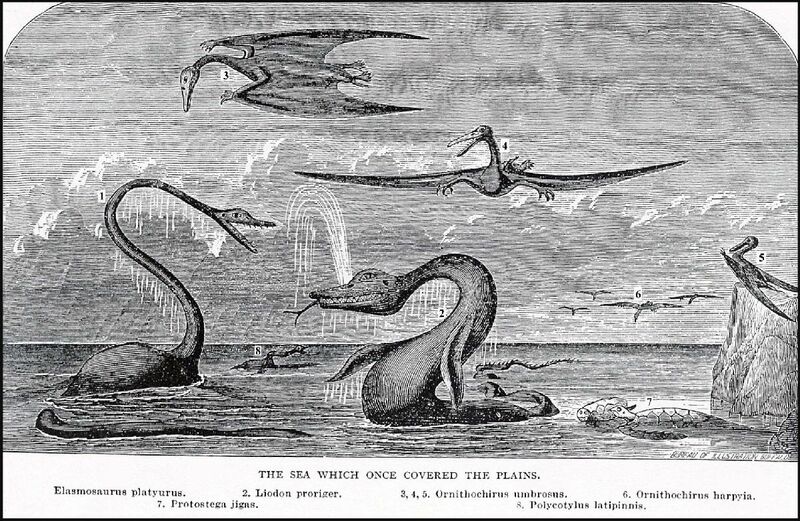 Edward Drinker Cope, Professor Paleozoic and Buffalo Land. Kansas Academy of Science, Transactions 106(3-4):177-191. Webb, W. E., 1872, Buffalo Land - An authentic account of the discoveries, adventures, and mishaps of a scientific and sporting party in the Wild West. Hubbard Bros., Philadelphia, 503 pp. GRAPHIC DESCRIPTIONS OF THE COUNTRY; THE RED MAN, SAVAGE AND CIVILIZED; HUNTING THE BUFFALO, ANTELOPE, ELK AND WILD TURKEY, ETC., ETC. The Appendix Comprising A Complete Guide For Sportsmen And Emigrants. 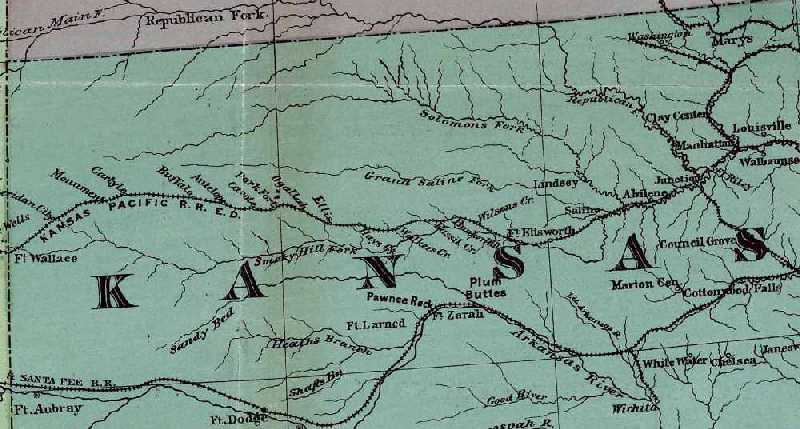 Plate from Webb's 1872 Buffalo Land. The artist is unknown but it is likely he was coached by E.D. Cope since all of the extinct animals in the picture were named by Cope from the Smoky Hill Chalk of Western Kansas. Webb's book does include two chapters written by Cope that he also published in 1872 in a USGS Report. See Davidson, 2003.